Enter your email address below to receive a notification when Empress Mimi starts accepting new sign-ups! Enter your email address below to receive a notification when Empress Mimi is accepting new sign-ups again. Use code NEW10 at checkout to get 10% off your first order! Limited time only. Upon purchase, your Empress Mimi box will be shipped within 3-5 days. After this, your box will be shipped around the 7th of each month. For UK addresses, please allow 3-5 working days from shipment for delivery. For International deliveries, we advise 5-7 working days. 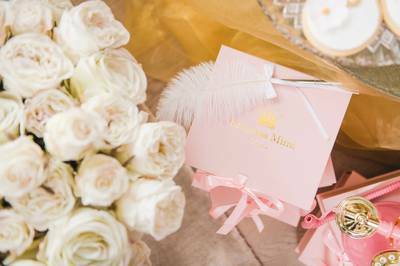 Empress Mimi delivers a custom box filled with delectable lingerie & luxurious sleepwear. Items change every month to keep things exciting, so every delivery is a special surprise. Depending on your choice of box, we can send anything from one pair of frillies to a full matching set with loungewear, accessories, and all things naughty & nice. I'm looking forward to receiving my first package!! I did make an error in my ordering process and I double ordered the box. I've cancelled 1 of the 2 subscriptions but I need to be reimbursed for the error. Please help! Many thanks for shopping with us and please do not hesitate to get in touch if there is anything else we can be of assistance with! I have tried other subscriptions to other lingerie companies and have never been satisfied until I gave empress Mimi a shot. Every box is beautifully put together and the quality of the products are amazing! My boyfriend loves them as well! I usually wear unsexy bras and briefs, but I recently read an article about how lingerie subscriptions promote self love and women empowerment. New year, new you, right? I decided to try Empress Mimi because the lingerie featured on their website is beautiful and I love that they are by women for women. I am located in the US and they are located in London, but I watched my order go from London to NYC to my house within the week. I was immediately impressed with the look and quality of the product. I received a beautiful, feminine, black 2 piece and a cute card with the backstory behind the selection. I loved the detailing on the bra and it was surprisingly comfortable. I cannot wait to see what’s in the next box. My husband is excited too, haha. Another type of Victoria secret. Beautiful box,nice quality product for the money. Received my first box this morning. The box was squashed and crushed, which was a bit irritating as I'd of liked to keep the box. The ribbon around the box was also filthy.. full of orange blotches. The underwear came in a nice little bag.. opened it.. and didn't like the underwear I'd got (obviously not the company's fault, and it was going to happen at some point if I kept subscribing). But the underwear felt like cheap material, and it's got dirty marks on it. I could of got the same quality of underwear from a shop for £5, and it would probably of been less dirty, so I'm quite disappointed. Cancelled my subscription as I decided it wasn't worth it. Thank you for bringing this issue to our attention. It was never our intention to send you a faulty box and we take your comments very seriously in this matter to ensure this does not happen again. Many thanks again and our sincerest apologies once more. So this was my first subscription to the House of Frillies box. I was happily surprised by gorgeous undies that were delivered. I've never even considered high waisted undies until now and I welcome the change. Can't wait to see what other lovely goodies get delivered in the future. I've only placed this review as 4 stars because I welcome the change in style but still figuring out how I feel about them on as this is my first time trying high waisted undies. The box and pouch looked really nice and high quality with the gold logos, was a nice surprise. The underwear was really pretty too, not exactly my style but will still wear. I'd subscribe longer if I could pick which colour and style I got. Really cool concept - I love getting the box with a lovely surprise inside every month! For me the sizing was accurate, I am generally a size small for clothing and the small bra and knickers fitted me perfectly. The products are of good quality and packaged nicely so it’s a treat to open!